He lived in Portugal and went to Rio de Janeiro, Brazil, in 1974 where he died in 1977. He was Chairman of the Board of "Lusalite - Sociedade Portuguesa de Fibrocimento, SARL" after 1943 when he bought the company. He married with Maria Emília (Licas) Viana Machado Mendes de Almeida, in 1933, in Lisbon. She was born in Lisbon in 1913, daugther of Boaventura Mendes de Almeida and Maria Emília Viana Homem Machado. Boaventura Mendes de Almeida was born in 1874, navy officer and was awarded the Ordem de Cristo, Avis and Torre e Espada. He was also a member of the parliament, governor of Lourenço Marques, Mozambique, governor of Macau, civil governor of Funchal, Madeira, and a teacher in the Naval School. Maria Emília Viana Homem Machado married him in 1910. She was born in 1889, and was the third Countess of Caria. Maria Emília (Licas) Viana Machado Mendes de Almeida was grand daughter, from her father side, of Fernando Mendes de Almeida and Maria Emília de Sacadura Freire Corte-Real. She was grand daughter, from her mother side, of Bernardo Homem Machado de Figueiredo de Abreu Castelo-Branco, born in 1856 and second Count of Caria, and his wife, married in 1887, Eugénia da Silveira Viana, born in 1849. Raul Isaac and Maria Emília lived in Rua Pau da Bandeira, 2, Lisbon and then in Rua de Inglaterra, 9, Estoril. 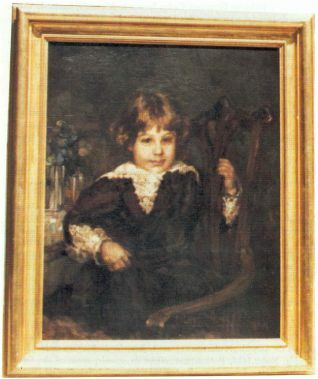 Raul Isaac Abudarham Abecassis painted by his uncle Fred Abecassis.